Let’s talk kitchens. 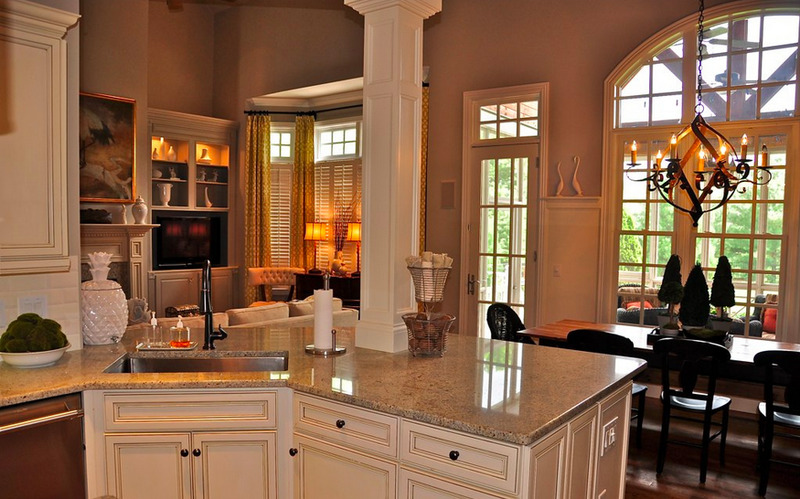 Or more specifically, my kitchen renovation. The kitchen renovation begins! Can I get a holla?! 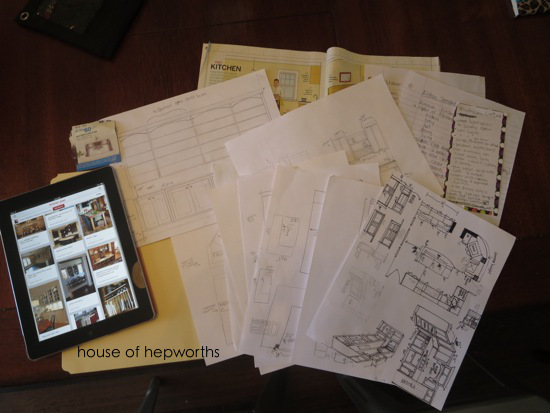 After months and MONTHS of planning every last detail of a new kitchen, we are ready to pull the trigger. This is only a small sampling of all the hand-drawn layouts I’ve done in the past 10 months leading up to this renovation. And none of these are even the final drawing either! Before we bought this house, we fell in love with the house, the layout, the 1+ acre property, and many other things. There is one thing we haven’t loved though… the kitchen. 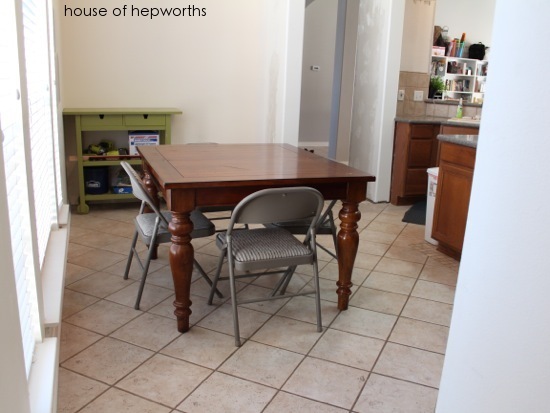 It is an awkward layout, the breakfast area is too small for a table to fit comfortably, and the cabinets are not great quality. 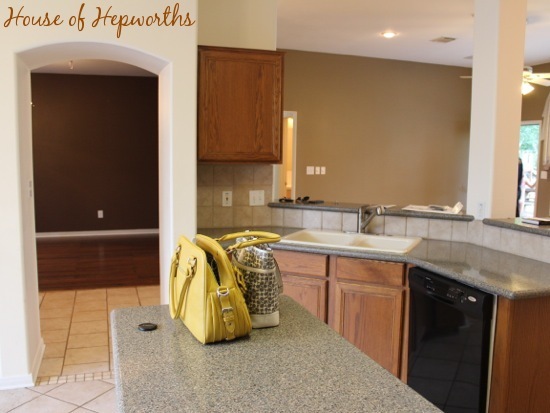 We decided that if we bought this house, we would put in a brand-new kitchen (and new floors – that is our other big renovation). 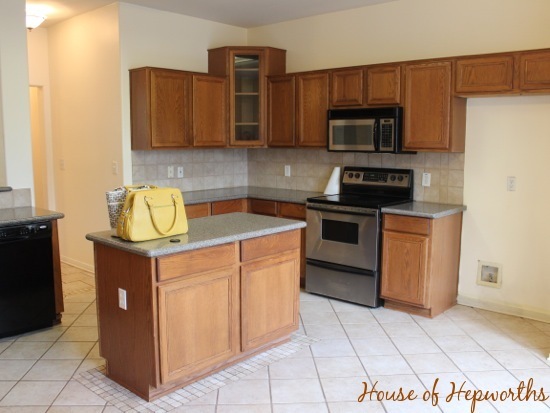 Let’s start with some “before” photos of the kitchen. 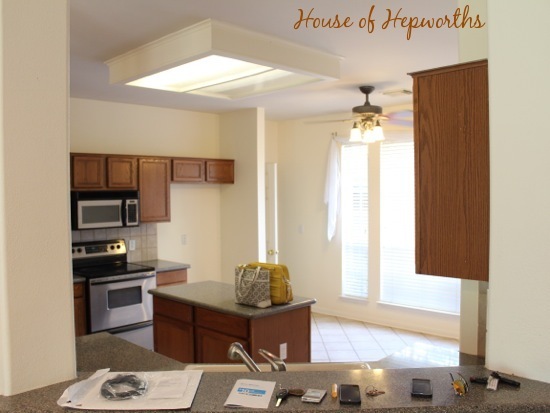 We knew going into this new house that the kitchen was going to be our biggest hurdle and that it would involve a renovation of some sort. It isn’t a terrible kitchen. It is functional. It does have several issues though including a stove that has several wonky or non-functional burners and a dishwasher that falls out of its hole if it is fully loaded and you open both drawers. 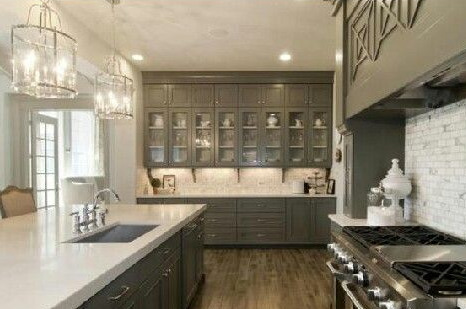 The counters are nice, but have a few cracks/holes in them and are not a color I would have chosen. 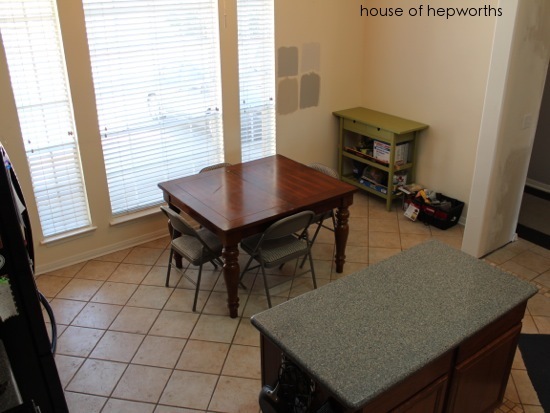 One of the biggest issues we have with the kitchen is that the breakfast area is just too small. It feels awkward, we had to take the leaf out of the table to make it functional, and my favorite industrial chars won’t fit. I stood on the counter for this photo to show more of a birds-eye-view of the island and table. The island is too small, but the table area is also too small. Plus there’s that awkward area on the right where the green cart is. Currently it is a drop off zone for my tools but we would love to have a big built-in desk there for the computer. I love the big windows. I plan on moulding them out like the ones in the family room, and then I want to get some nice big shutters installed. Yum. 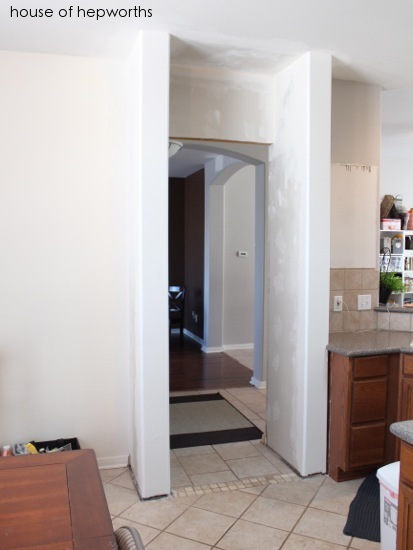 And here’s a quick sneak-peek of the archway we removed. I haven’t blogged about it yet because I’m (obviously) not totally done with the mud and texture. If you haven’t noticed, things have been slow-going at the house since we moved in 10 months ago. That’s because we have been putting every last penny into our kitchen fund. After reading Dave Ramsey’s Total Money Makeover several years ago we have tried to live debt free (except the mortgage) and pay for everything in cash, so instead of just taking out a renovation loan, we have been saving like crazy so that we can update the kitchen without going into debt for it. The good thing about taking 10 months to save up enough cash for a renovation is that we have had 10 months to live in the space and really get a feel for exactly what we want. 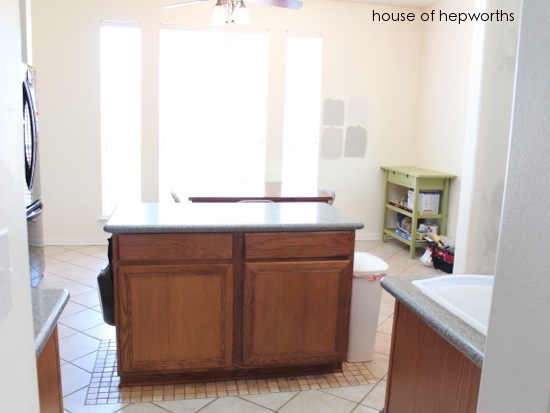 I have been planning out the kitchen for months and it has gone through several layouts and ideas. We have decided to hire a local home builder to renovate our kitchen. 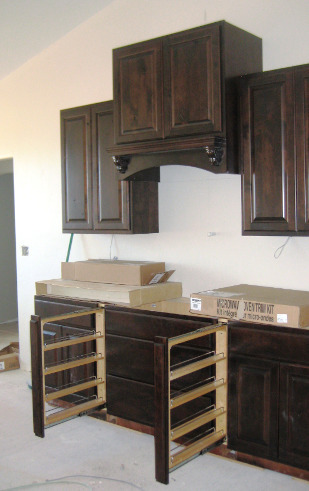 We have gone back and forth for months on what type of cabinets to purchase (IKEA, semi-custom, big-box store, custom, etc) and ultimately decided to hire a local home builder who has a custom cabinet maker. There is a lot that went into this decision, but the main reasons are 1) his kitchens and cabinets are amazing quality and we love the look of them, 2) our kitchen is a very irregular size and standard-sized stock cabinets don’t fit well, and 3) because we are going local with a smaller home builder who has a local cabinet maker (as opposed to a kitchen renovation company or a cabinet company), we are getting completely custom-made solid wood cabinets for around the same price as if we had purchased semi-custom cabinets from a big box store. I’ve got tons of little details to share with you guys, but for now I’ll just give a large-scale overview of where we are going with the renovation. In the next post I’ll try to give more of the smaller details and also will answer any questions you have asked in the comments section of this post. After lots of measuring and taping, our island will be a tad smaller but will still hold 4 people comfortably. Next up, the cabinet color and style. After lots of hemming and hawing we’ve decided to go with a dark brown stained cabinet. I opted for a dark brown because I love the look of them, they won’t show dirt as smudges like white would, and they are a finish and shape that will always be in style. The builder we have hired is building a house down the street from us and just put in the cabinets a few days ago. 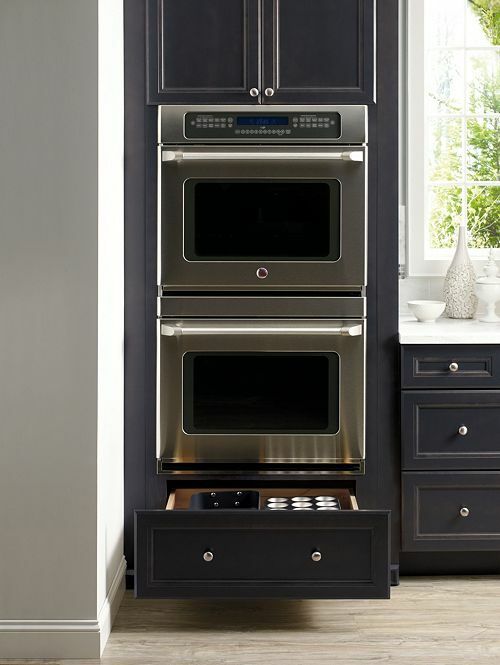 These are the exact same cabinets we are going to install. Shayna at The Wood Grain Cottage installed a kitchen in almost the exact same style and finish that I am doing. 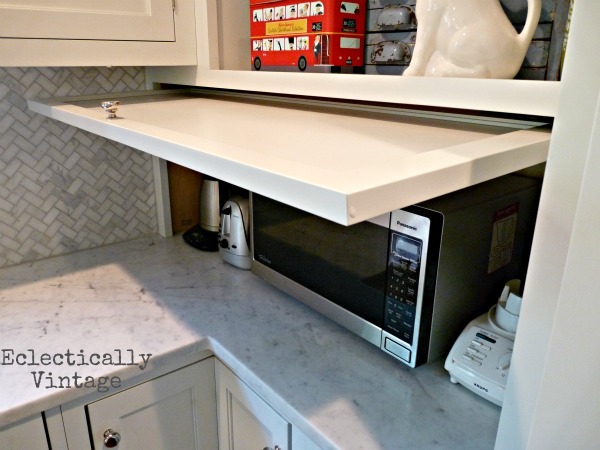 She also added three features that I am obsessed with and am adding to my new kitchen – the pull-out spice ranks, the vent hood cabinet with a mantle on it, and a cooktop (not pictured) with drawers under it. Next to it will create a somewhat awkward corner space so we’ve decided to add a feature I’m super thrilled about – an appliance garage! After much online sleuthing I’ve finally managed to find an appliance garage that is the most similar to what we are adding over at Eclectically Vintage. We won’t be adding the big open space above the garage though. This area will go directly to the right of the new tall oven cabinet. Here’s an image that is the most similar to what we’ve designed. 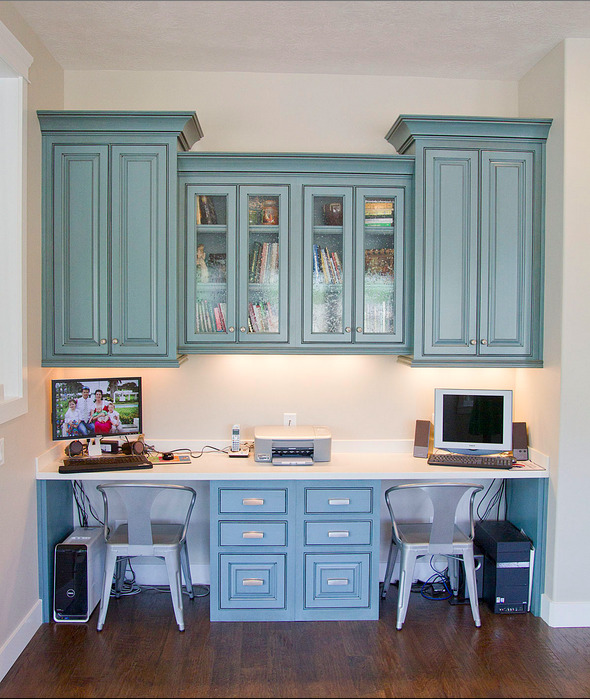 Our desk will only have one center drawer unit under the desk (as opposed to this picture’s two units), and ours will have open shelving where the glass cabinet doors are. Other than that, almost identical. 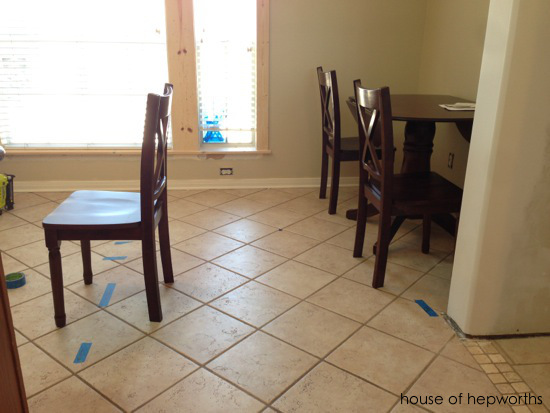 When I taped off to measure for the island, I also taped off the desk area and added some chairs. On paper everything fit, but I wanted to make sure it didn’t feel cramped in real life. Also, you are getting a sneak peek of the new moulding going in around the windows! Ben pointed out that maybe we should have the cabinet builder make custom cabinets for the dining room so that everything matched. 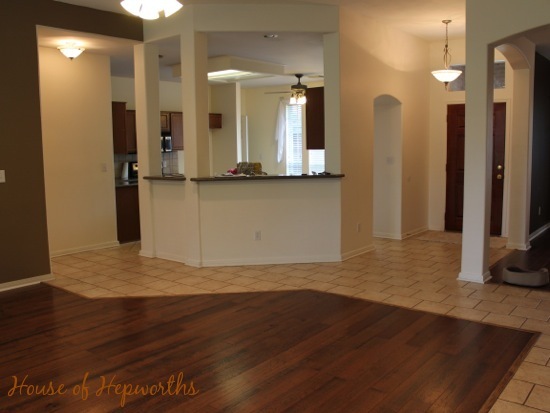 The kitchen and dining room are across from one another, and they are both the first rooms you see when you walk into the house, so it seems like a better idea to have them match. So, yup, we are adding the custom cabinets in the dining room as well. They will be similar to what I previously planned, but I’ve made one minor change to the plan. Instead of the shelving part coming down and sitting on top of the counter I’m going to just have cabinets above that are doorless. It will look more like a butler’s pantry or buffet, but the base cabinets will still be almost as shallow as the upper cabinets (most kitchens have 24″ deep base cabinets and 12″ deep upper cabinets. 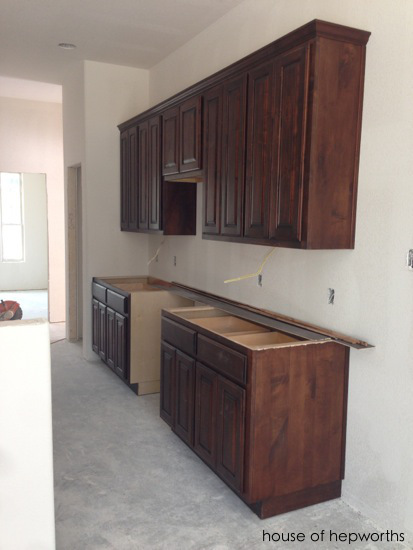 Our buffet will have 15″ deep base cabinets and 12″ upper cabinets). 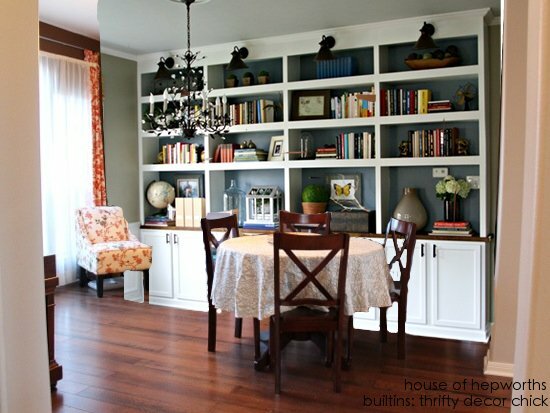 Here’s a picture I found that is most similar to what I have in mind, but picture the buffet with cabinets (no drawers) on the base cabinets and no doors (just open shelving) on the upper cabinets. The cabinet fabricator comes this week to do a final measurement to begin building the cabinets, so now I’m packing up the kitchen (didn’t I just pack like 10 months ago?). We are packing up the entire kitchen and are planning on living with no kitchen for 6-8 weeks. The grill has a full propane tank and we are stocking up on disposable plates. We’ll be setting up a microwave and fridge in the dining room. I don’t dare cram any more info into this single post (my fingers are almost numb from typing so much already!) so I’ll give even more details in the next post. Also, I’m going to try to keep this renovation blogged in as close to real time as possible, so there might be some posts that are a quick small update, and others that are more detailed. If you have any questions or any awesome ideas or input, please tell me! 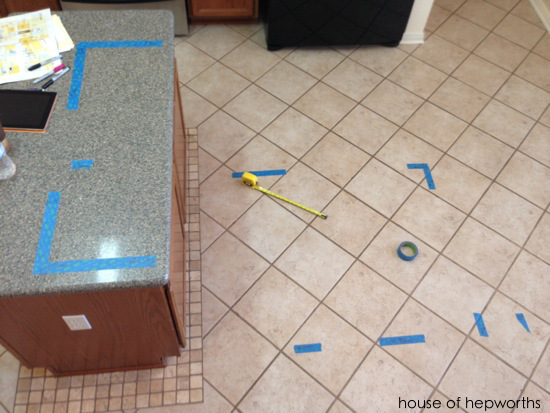 We finalize the kitchen plans later this week, so I still have time to make last minute adjustments. It’s going to look amazing!! So excited for all of you, and can’t wait to see the progress & finished reno!! How exciting! Can’t wait to see how this turns out! These are big and amazing plans! So looking forward to seeing how this turns out. It is all going to look amazing. Exciting stuff! 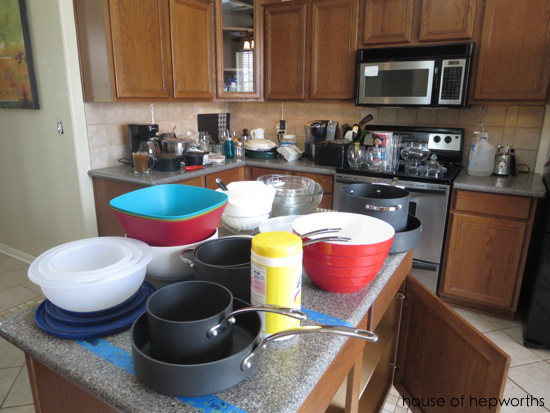 We are renovating our kitchen next year – can’t wait. Question for you…are you using a specific software package for your renovation? In the photo with your plans, it looked like you had some auto-generated drawings. Looking for recommendations so I can get started with putting some options together. I have been hand-drawing everything. Super old school. lol. The cabinet guy has a program that he will be using though. Thanks for this post. My hubby and I are planning a kitchen redo, and because of our Dave Ramey “debt free” comment we are also not taking on new debt for the reno. I love all the great ideas and the encouragement to pay cash. I wish you the best and can’t wait to see to rest of the process. Oooooh, SO nice! I’m looking forward to seeing all this happen. I’m envious. My kitchen is kinda not my favorite part of my house. Sad since I spend so many hours there! My island is pretty much identical to the one in the photo and I LOVE it. I also said that we would eat mostly breakfast there and we end up eating at it almost all the time. With seating on 2 sides, you can talk to each other. It is a bit awkward when you have a row of stools. The big island is also awesome for entertaining! Can’t wait to see it when it is finished. It is painful but so worth it! I would recommend you keep your crockpot out as well–great for soups, pulled pork, shredded beef for tacos and the like. Also, I do have dark cabinets and they show smudges as well as white cabinets–dirty kids’ hands are dirty–plain and simple!! It sounds like you are going for a traditional space that you will enjoy for years to come. We can’t wait to see the progress! 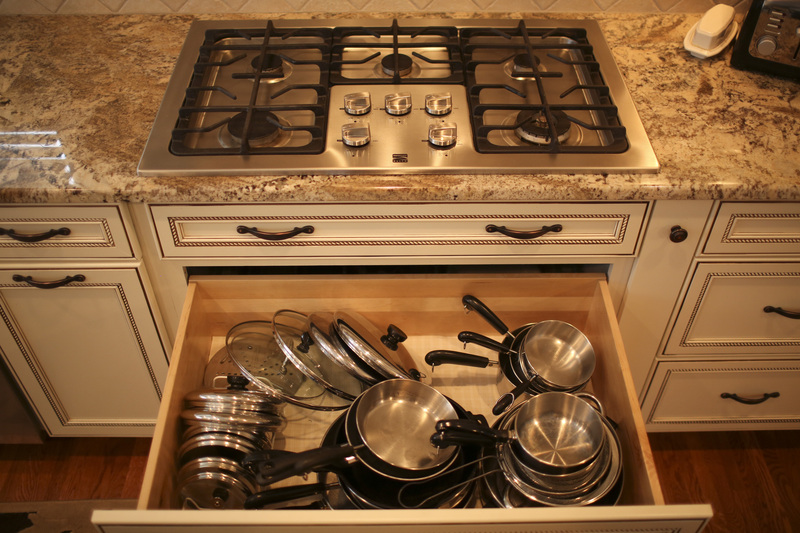 Have you thought about getting under cabinet drawers installed where the kickplate is? I just learned about it recently, and I think it’s a brilliant use of otherwise wasted space. 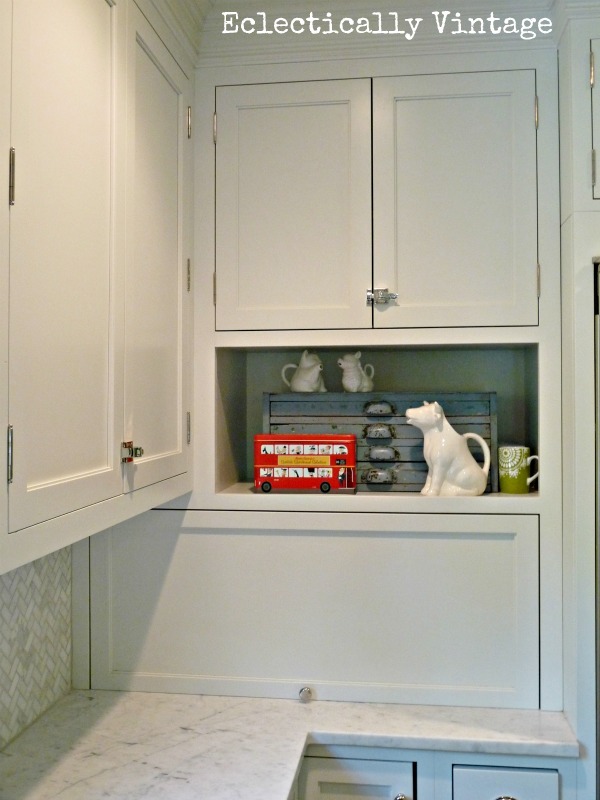 Since you are getting custom cabinets anyway, you might want to consider it. OH WOW so much excitement!!!! following right along! These plans look amazing. 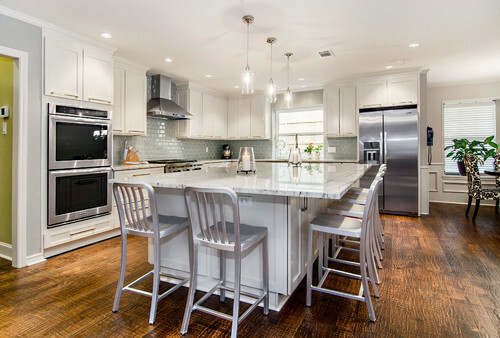 I especially love the idea to put in a nice, big eat-at island in the kitchen while utilizing the dining room for family dinners. Dining rooms always seem to be the most lonely and overlooked rooms in a home, so I love that yours will be getting some love and some major function point after the renovation. I can’t wait for the next update!